I was craving a snack, and I had oat flour to use up, so these bars were born. 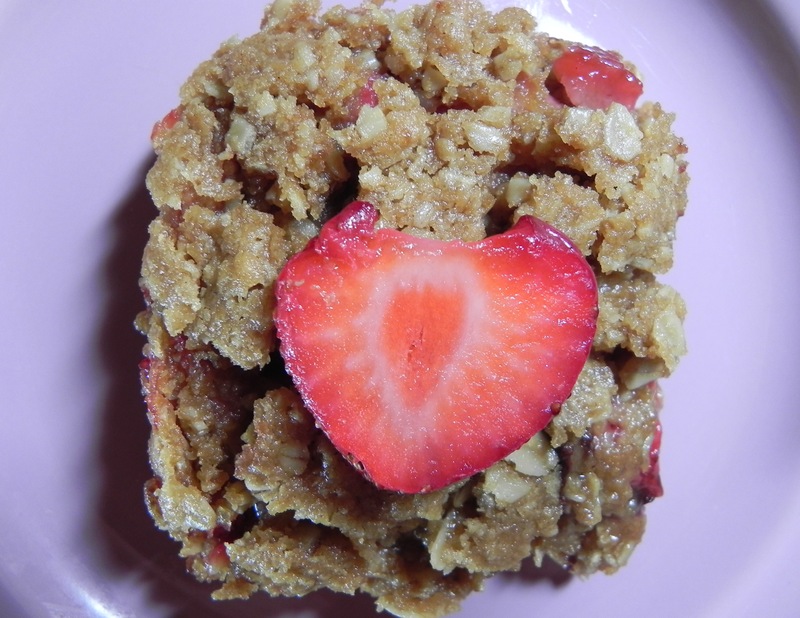 They’re a yummy combination of chocolate and strawberry with the healthiness of oats. It’s a fairly simple recipe to make, after you get a few things chopped. Plus, you can eat them for a breakfast treat. The recipe I found had blueberries but I envisioned a chocolate covered strawberry. I also swapped out some all purpose flour for the oat flour I mentioned. Baking powder and milk were included to give lift to the gluten-free oat flour and add moisture needed at high altitude. Line a 9×9” pan with foil, leaving overhanging flaps, and grease with shortening. In a food processor pulse together flours, oats, brown sugar, baking powder and salt until combined. Add in milk and margarine and pulse until combined. Divide mixture in half and press half into bottom of prepared pan to form a crust. Spread chopped chocolate over crust. 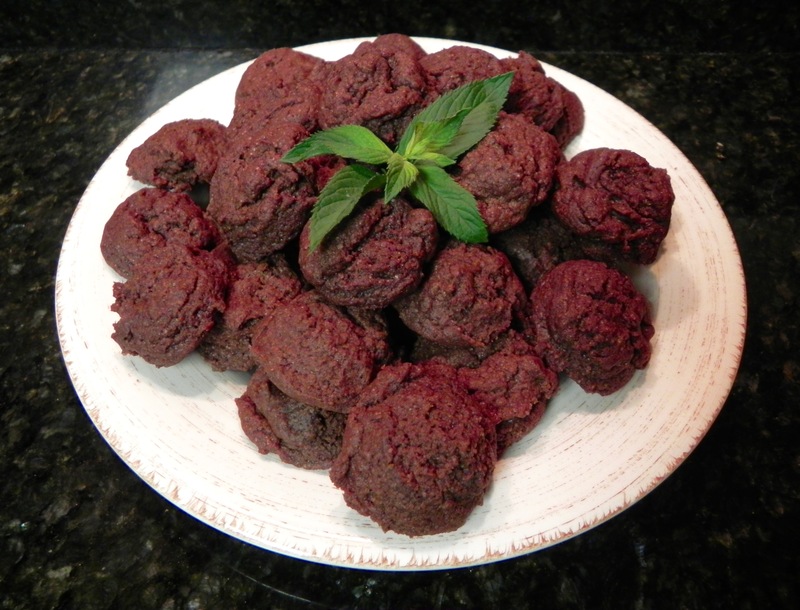 In a bowl, whisk together vegan sugar and arrowroot. Add in strawberries and coat in sugar mixture. Spread berries on top of crust. Spread remaining crust mixture on top of berries and press lightly. Refrigerate pan for 15 minutes. Preheat oven to 350F. Bake for 35-40 minutes until fruit starts to bubble. Store in fridge for 3 days in an airtight container. Until next time, happy baking! Admittedly, I love watching cooking shows, a habit that began when I was seven. I learn techniques, get food inspirations, and often walk away hungry. Nowadays, thanks to the internet, I can even get my food fix listening to all manner of cooks via webinars and recorded interviews. Over the past few years I have been attracted more to healthier cooks. On The Next Food Network Star I find myself cheering on those who cook for nutritional needs, and I loved when the first vegan baker won on Cupcake Wars. But there is one interesting thing I’ve noted – vegan cooks are just like other cooks. The vegan ones may say a word about loving animals, or not, but all cooks share an interest in creating memorable food. Their eyes light up when talking about how food comes together. 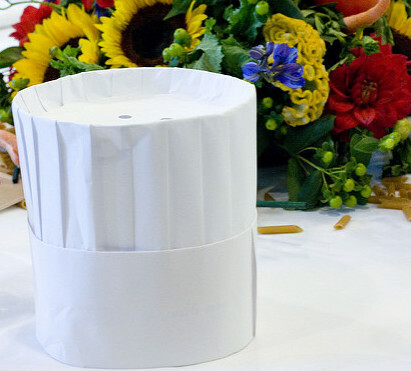 It’s this passion for making good food taste good that attracts me to food preparation. There were times when my only interest in food was to make hunger disappear, but now I am fascinated with how food is made. I am also inspired to experiment with other people’s ideas and make them better for me, improving on taste and texture to suit my appetite. These inspirations lead me into the kitchen with thoughts whirring in my head – should I use less oil, I’ll substitute an ingredient I like better, that bread would bake better at high altitude as mini loaves. It’s the creativity in food that makes me want to create a wonderful dish. As a matter of fact, there is a recipe I saw the other day that I want to adapt. I guess I should go get started. The cookie monster reared its head, so I searched through my recipes for something new. I saw sugar cookies and ginger cookies and nut cookies, but knew the cookie had to have chocolate. And then my brain morphed a few ideas together and decided on chocolate mint. The only consideration I had to take for high altitude was to add extra liquid for the dry atmosphere. I borrowed a bit from this recipe and then that, but I used vegan ones from the start so I didn’t have to make changes. After it all came together the scent of the dough reminded me of mint fudge. My kitchen smells like Christmas in July. Preheat oven to 350F. Sift together flour, salt, and cocoa powder. In a stand mixer, beat margarine until smooth. Add sugar and beat until smooth. Add extracts and chocolate milk and beat until fluffy. Slowly add flour mixture to margarine mixture. Beat until well combined. Place cookies 2” apart on a baking sheet lined with parchment paper. Bake for 10-11 minutes. Let cookies cool on baking sheet for a few minutes then move parchment paper with cookies to a wire rack to cool completely. Makes 4 dozen one-bite cookies. Another hot day, another no-bake recipe. Besides making a tasty treat without turning on the oven, I wanted something that my athletic husband could take on the go. I added superfoods for quality energy along with coffee and chocolate for a mocha tasting breakfast bite. Healthy mocha goodness was a good choice because they are yummy enough for dessert. 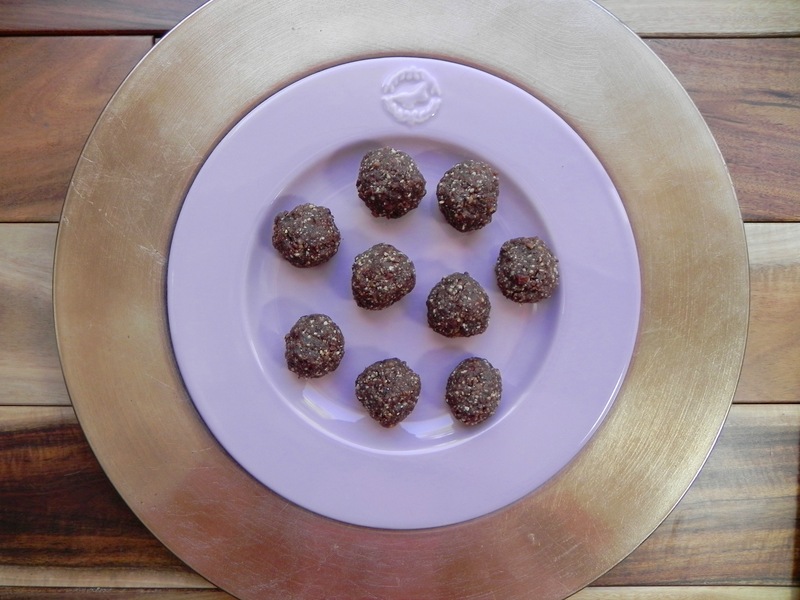 I have been collecting “energy balls” recipes for years, so this is an amalgamation of all of them with no nod to a particular author. I did choose ingredients that would not require refrigeration to make them an easy, anywhere snack. And, of course, there was no baking involved so no consideration was taken for high altitude. Soak dates in warm water for 5-10 minutes, depending on the dryness of the dates. Save the date soaking water. Grind almonds and cacao nibs to a coarse powder in a food processor. Add salt, mulberries, and cocoa powder and pulse a few times. Add dates in batches. Add coffee extract. Squeeze mixture into balls. If too dry to form balls, then add a bit of the saved date water. Store in an airtight container. Will keep for one week. Until next time, happy non-baking! Note: I do not make any money by mentioning products by Navitas Naturals – I just like them. Today is the celebration of Independence Day in America. 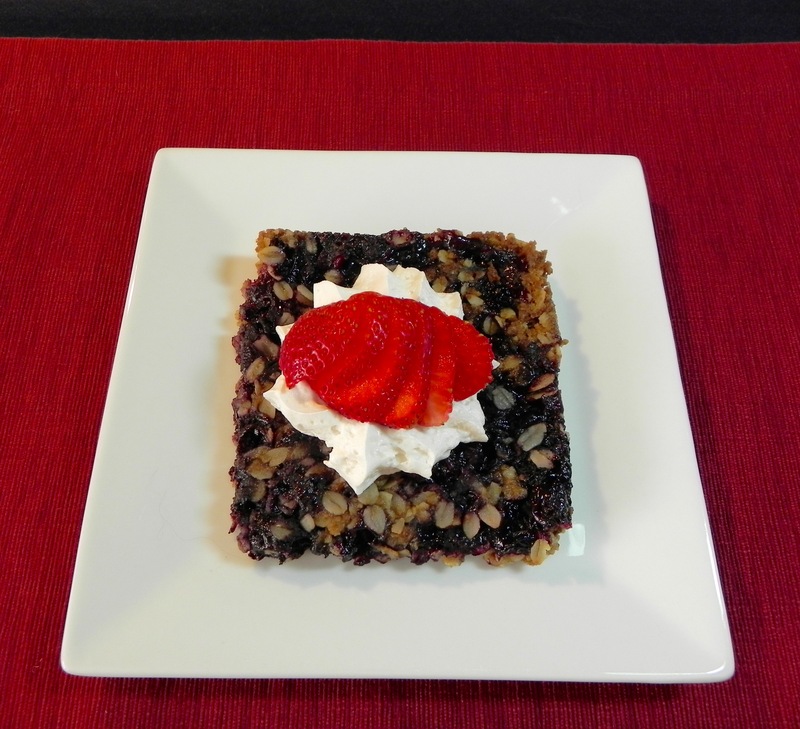 Befitting the red, white and blue color scheme that accompanies the holiday, I chose to bake a blueberry bar and top it with whipped cream and strawberries. Because I was sharing the bar with friends that have selective eating habits, I opted for dairy free, egg free, soy free, refined sugar free, gluten free, and nut free. Or, as my husband calls it, the BFF Bar – Blueberry Free From Bar. To bump up the health factor on the bar recipe I found, I used whole oats to add fiber and texture. I also chose maple syrup and dark brown sugar for their added health benefits. After I realized I didn’t have enough fresh blueberries, I discovered that frozen works as well as long as they are fully drained. For a garnish I used vegan whipped cream and sliced strawberries even though the blueberries turned dark when baked. It became red, white and black, but I like it anyways. Preheat oven to 350ºF and grease an 8×8” baking pan. In a bowl, whisk together oats, flour, brown sugar, baking soda and salt. Add melted margarine and stir with a fork until evenly combined. Save ½ cup crumb mixture for topping. Press remaining mixture evenly and firmly into bottom of prepared pan. Bake for 12 minutes to set crust. While that is baking, combine blueberries, maple syrup, arrowroot and lemon juice in a small saucepan, whisking until arrowroot dissolves. Heat over medium heat until mixture comes to a simmer. Simmer, stirring occasionally, until juices are no longer cloudy, about 2 minutes. Spoon filling over baked crust and evenly spread reserved crumb mixture over top. Bake for 30 minutes. Let cool completely in pan. Cut into squares and garnish with whipped cream and strawberries before serving.